I was thinking perfect world keep original xo for posable future buyer. But bobs cap kit is definitely least money route. In your opinion AA or A better? Thanks for the reply. 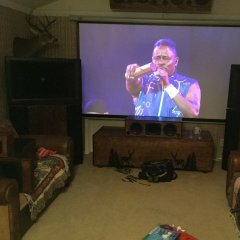 I amdeciding to have 4 subwoofers in total.I have bought 2 female to 1 male y splitter rca cable.The male side of the cable will be plugged into the one of the sub outs of my receiver and i will connect 2 subwoofers from their lfe input.Do the lfe inputs on the subwoofers work even we connect them with a rca y splitter as i mentioned above? Or should i daisy chain with them iver the subwoofers output connections? "The Godfather" or "The Ten Commandments"?? How much weight can dry wall anchors handle, find out here. The KHorn now has the rear panel sealed since the 70th editions. 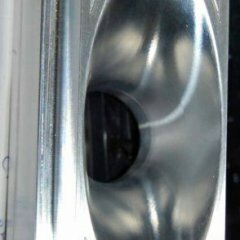 That is likely where the extra length of the horn is coming from. They can call it whatever they want! All I know is that it sounds great! 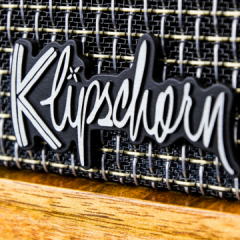 I just wish Klipsch would give 70th owners like myself a chance to upgrade to the new tweeter. You can change the primary cap to 13uF, move the squawker wire to tap 4, remove the electrolytic, and it will be a Type A. You're welcome. I suggest Type AA or Type A. Contact Bob Crites @BEC at critesspeakers.com. Upgrade phono stage or cartridge? I'd go along with that notion. Transduction is harder to pull off well. I'm not familiar with the specifics to which you're referring, but if the "mean path length" was from the throat to the last part enclosed, and the back is now closed in, which it looks to be by about 30" or so, then 66 would pretty much be 96 now? These are tentatively sold but if not you are 2nd in line Schu. I gotta pack tomorrow, too! Planning to load up and hit the pavement NLT mid-morning on Monday...gotta stop a few places on the way...should be in my Super8 room sometime between 8 and 11 Monday night! Looks like I will be hitting Little Rock area during early lunch hour traffic, but I need to make two stops in that area, so will likely get out of the area around time the initial off-work traffic hits 2:30-3:00, but still have to deal with it until past Benton...drive to Prescott for my next stop 4:30 or so, for a couple of hours or so (meaning twice that much time)...then to Hope and the room! Too subtle, I just like all the little jokes in between the intended jokes and how they made fun of history. I couldn't remember if it was part one or two so I looked it up and posted 1.